Tilly and the Buttons: First Peek at My New Book! It’s been a secret for far too long… I’m so excited to finally share with you the title and cover of my new book - Stretch! Make Yourself Comfortable Sewing with Knit Fabrics. Published by Quadrille, the book will be out in early March 2018 – and you can pre-order it NOW from Amazon.co.uk (UK) or Amazon.com (North America)! So what’s the book about? Two key words in the title say it all – “stretch” and “comfortable”. 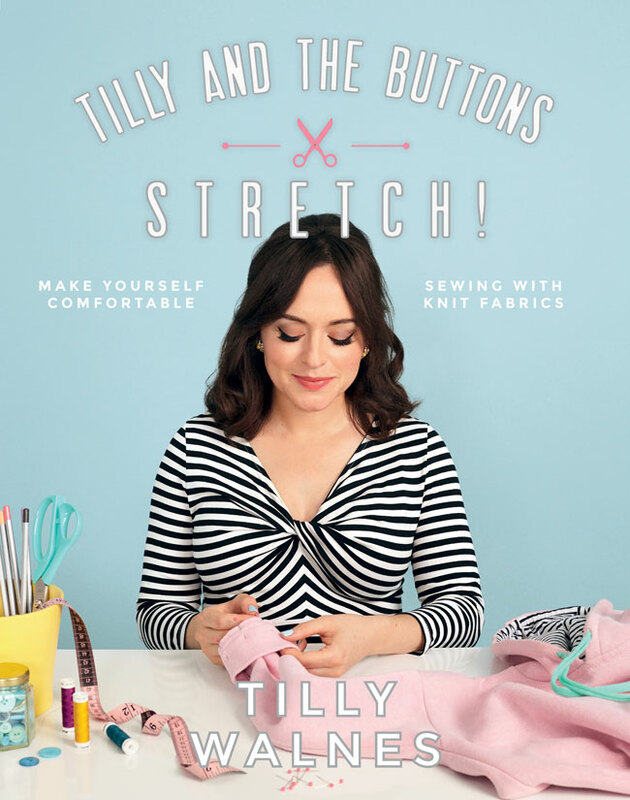 A perfect follow on to my first book Love at First Stitch, it’s about stretching your skills by learning to sew stretchy knit fabric; and getting comfortable with these fabrics so you can make clothes that are so comfortable you’ll want to wear them every day! Stretch! is jam-packed full of techniques and tips for choosing, cutting, fitting and stitching jersey, double knit (or ponte), sweatshirting, sweater knits, stretch velvet and sequin knits. Knit fabrics have a reputation for being tricky to sew – but I want to show you that, with a few tricks up your (handmade) sleeve, they’re actually not that difficult after all. In fact, once you know how, knit fabrics are speedy to sew, a dream to wear – and totally addictive! The book will show you how to sew with these versatile fabrics on both a home sewing machine (with an adjustable zigzag or stretch stitch) and an overlocker (AKA “serger”). If you've ever struggled to thread an overlocker or set the tension correctly, you'll really appreciate the troubleshooting tips! An overlocker isn’t essential though – you can make all the projects in the book on a regular sewing machine. Speaking of projects, this book isn’t just about the theory. It also takes you step-by-step through making six comfortable, wearable garments, with patterns provided on full scale sheets in the back of the book. So if you’re already confident sewing knit fabrics, the book will help you expand your handmade wardrobe with a range of versatile patterns. Plus there are variations for each one – for example, turn the pencil skirt into a cute pinafore dress, or add a contemporary ruffle to a turtleneck – so you can add a unique twist to your clothing. I can't tell you how happy I am with the finished book. The patterns are so lovely and wearable, I know the technique sections are going to be really helpful, and the photography and design looks stunning. I'm itching to get my hands on a copy of the book once it's printed to show you more - and I'm already daydreaming about seeing what people make with the patterns! In the meantime, you can reserve your copy now from Amazon.co.uk (UK) or Amazon.com (North America). Thank you so much for your support!